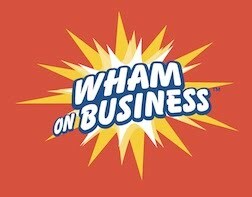 Wham on Business: Why Should Anyone Follow You? Needless to say, if you’re the leader of your business, you’ve got to have followers. So, you’d better know what it takes to lead effectively. 1) You need to selectively show your weaknesses. By exposing some (and the operative word here is some) vulnerability, you’ll reveal your approachability and humanity. 2) You need to rely heavily on intuition to gauge the appropriate timing and course of your actions. “Soft” data will help you know when and how to act. 3) You need to display a “tough empathy” leadership style. Inspirational leaders empathize passionately and realistically with people. And, they care intensely about the work their employees do. 4) You need to reveal your differences. This way you’ll capitalize on what's unique about yourself. If you employ the following principles along with basic strong management practices, you will excel at inspiring your people; in capturing their hearts, minds and souls.